In the kitchen since the age of 11 and having loads of fun with it. Joao and I went to Sao Paulo’s Mercado Municipal last weekend – the one Anthony Bourdain visited in one episode of “No Reservations”; btw, I’ve read he said some mean things about the city. I hope he never comes back, thank you very much. I found these bars here and used a different pan to make them. Make sure you use a warm knife to slice the bars, so you won't mess up the topping like I did. Preheat the oven to 180ºC/350ºF. Grease and line a square 20cm (8in) baking pan, leaving some paper hanging out of the pan on at least two sides (it will make unmolding easier). To make the shortbread base, cream the butter and sugar until pale and fluffy. Sift in the flour and cornstarch and, using a rubber spatula, then your hands, work to a dough. Place in the pan and use your fingertips to roll out flat and into the corners – if you have much too warm hands you might try it with the back of a spoon, lightly dusted with flour. Bake for 20 minutes or until golden. Set aside to cool.Scatter the apples over the cookie base, spread over the dulce de leche and level out. Chill in the fridge for 1 hour.Melt 150g of the chocolate in a glass bowl over barely simmering water. Remove the bowl from the pan and quickly wipe the water with a kitchen tower – no water should be in contact with the chocolate. Add the remaining 50g of chocolate and beat well to melt it. Pour the melted chocolate over the caramel and apples, then spread evenly. Set aside to cool at room temperature for about 2 hours or until set. Remove from the pan and cut into squares. 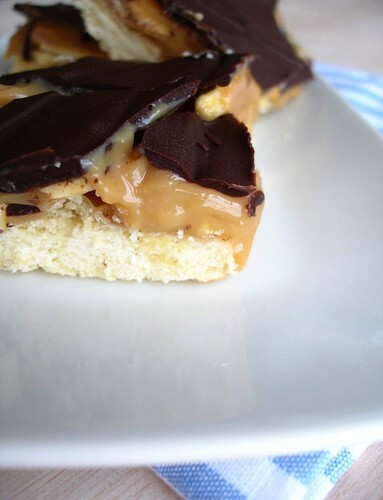 * you can warm the dulce de leche into pouring consistency prior to adding it to the cookie base. Yummy and pretty! What a combo of flavors! Oooh! Those look a lot like the Millionaire's Shortbread that I discovered in Scotland, but without the apples. I could eat the whole batch myself! Having just consumed and bought a load of macadamia shortbread and all its variations, I'm ready for a new twist to it. This looks mighty evil, but so very good! Chocolate and caramel and apples -- can't go wrong with those lovely flavors. Well Tony Bourdain didn't see these shortcakes, so he snoozes & loses! oh my goodness! those look amazing! i never have dried apples around, but i may have to pick some up for these. From what I remember of that episode of Bourdain's show, he was drunk for much of the time, so pay no attention to anything unkind he might have said about Sao Paolo. Obviously he didn't taste your cooking! Those look insanely, ridiculously and overwhelmingly delicious. Wow! Very British recipe...and very appealing, too. I rarely have dried apples around, but might have to find some to make these. This looks so interesting. Yum!! I could really sink my teeth into these...wow, what a recipe. Oh my, look at all that gooey goodness. Oh man, those look amazing! Gosh, I'm in love with your madeleines and pictures. They're gorgeous! I want to give you a hug. I am so in love right now!! This is something I'd end up eating all by myself - the whole pan!! It seemed like he liked it down there while on the show. That market alone made me want to go to San Paulo. Oh my! Patricia, you're a bad influence, and I mean that in a good way. Susan, I did not know about this millionaire's shortbread, really? I'm glad I know now! Tks, darling! Kickpleat, it was my first time making something with dried apples, too. Elle, I think I'll be making more recipes with dried apples, not to mention they are a wonderful snack. Cathy, and there's minimal baking involved! Kelly.Dee, thank you for stopping by! Very unusual and delicious - perfect for Fall. 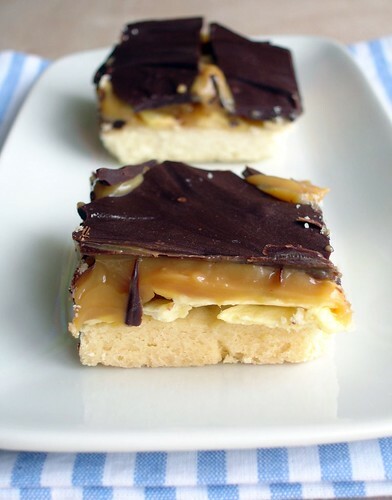 The apple is a great idea to add to these toffee shortbreads. Looks delicious! I think the topping looks great all broken up. You have to break it when you bite into it, right? You know me and caramel, these are right up my alley! Those look incredible! I'm drooling now! Ooh. You're killing me, Pat! It's almost midnight on my side of the world but i sure could do with a slice (or two) of those right now. these look sooo good. i bet i could eat them in mass amounts. YUM! woah... those are my favorite flavors... caramel and apples! those remind of the TWD snickery squares, but yours look better! Every layer of these cookies is making me salivate! What a beautiful combination of flavors!